my name is Randy I live in South Carolina and I'm an older ( much ) older beginner I started teaching myself how to play at the ripe young age of 51 ☺️ I am the proud owner of 2 instruments. Lots of beginners of all ages here, you'll fit right in! This was my great grandfather, Harry Girt, back in about 1916, probably in the Rainier, Oregon area. His mother's side of the family road the Oregon Trail back in the early to mid-1800s. I often wonder where that violin ended up. I know that my grandmother's sister had it, but I do not know where it went after she died. Perhaps her son still has it, or maybe he sold it, I never asked. When I first brought my school violin over to my Grandma's house, she told me that her father used to play the violin. I have found photographic evidence that was indeed the truth. 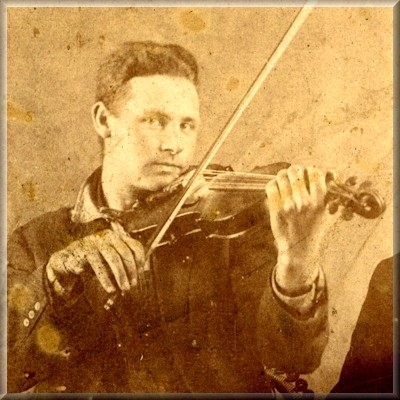 There is at least one other picture of him holding a violin, that I know of, in my father side family's photo albums. Hello Randy, I am also of the 50+ (and up) beginner violin group. I have been to South Carolina once. I was there for about a week before I was shipped off the Fort Benning, Georgia, back in January of 1983. My mother's mother was born in North Carolina, and she had blood ties in neighboring states, including SC, so I also have southern blood in my mix, although I am mostly of northern stock. Rather sad to think that back during the Civil War, I had ancestors shooting at each other (in general, I do not know of any specific battles between ancestors). By the way, it may have been my great great grandfather, Charles Girt, who took that picture in the above post. @N4SXX Welcome...wait... 51 is not old. 🙂 That's my new age also. Welcome and enjoy. Fantastic that you get to have a family fiddle in your hands. @MACJR very very cool picture. Having that family fiddle in your hands must really feel special. Congratulations on that. If you are ever in south Florida feel free to pay a visit if you need the instrument looked over. The difference between a fiddle and violin is that it is OK to spill beer on your fiddle.